TORONTO - April 23, 2018 - PRLog -- All around us, conversations are starting, books are being written and journeys are beginning, all in the name of Happiness. What defines your happiness? Is there an ideal? How do you measure it? And, how do you seize happiness? Our everyday lives are consumed by trying to achieve the satisfaction of everyone but ourselves. The "I'm busy" statement that seems to have replaced "I'm fine" has become an epidemic. It's not until we are run down—both physically and mentally—that we've realized our lifestyle has turned into an assembly line of sorts. We are existing, instead of living, and as women, we need to redefine the meaning of happy, whatever that means for us. 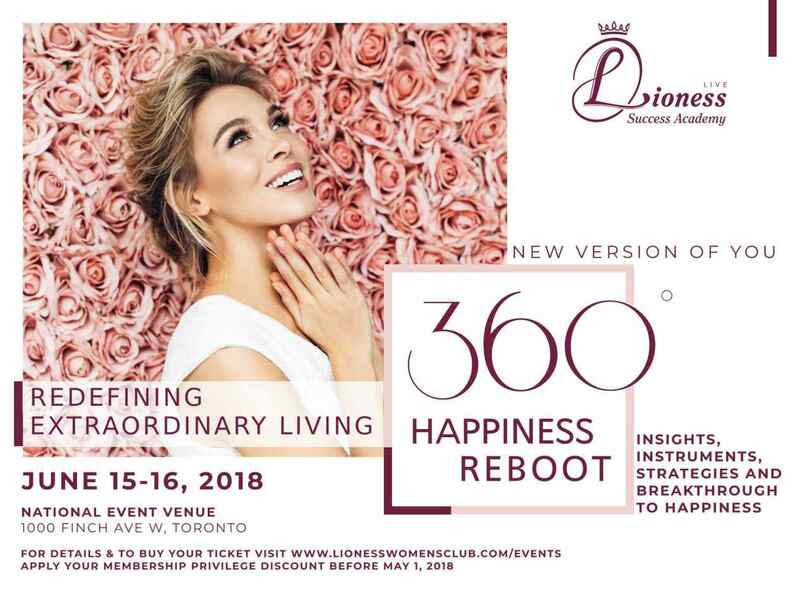 Mentors, speakers, and thought leaders alike will be coming together in the name of happiness, wellness and personal wealth at the first 2-day 360° Happiness Reboot Summit hosted by Lioness Women's Club at the National Event Venue in Toronto, on June 15th and 16th 2018. This 2-day full immersion summit will include workshops, lectures and interactive classes like The Magic of Wellness and Meditation, Nine Mantras for Business Success, The Alchemy of Modern Femininity, My Romance with Finance, and include interpersonal connections with happiness and wellness influencers such as Lesley Edwards, co-author of Love & Coaching with Men are from Mars, Dr. Gillian Mandich otherwise known as Dr. Happiness, Linda Martin, a strategic, action-oriented expert and leadership mentor, Tanya Chernova, co-author of UnderMind: Discover the 7 Subconscious Beliefs that Sabotage Your Life and How to Overcome Them, along with other experts who will present participants with the tools to discover how to identify and redefine extraordinary living, simply, in their every days lives. The complete agenda for the event can be found on their website (https://www.lionesswomensclub.com/events/redefining-extra...). Founded by Jane Katkova-Brown in 2010, the Lioness Women's Club brings together like-minded women locally and from around the globe to share the passion for conversation, beauty, style and success. She explains, "Lioness was born out of my pursuit to create a platform to support and promote self-fulfillment in women, for them to be able to focus inwardly, celebrate outwardly, and embrace personal development for their own joy and happiness, rather than for business or career goals." Talking about the vision behind 360° Happiness Reboot Summit, Jane says, "We purposefully designed this event to serve women, to encourage them to find higher purpose, expand their minds, share their wisdom, support each other`s growth and inspire meaningful collaborations which create a lasting impact on our society, culture and values."